Line the serving dish with 20 pink cupcake cups, and then place the white cups inside the pink cups. Doubling up the cups will give the cups a little more stability, especially for those little awkward hands. Fill each cup with a few grapes, blueberries, and mandarin oranges. Cut the strawberries in half. Using a toothpick, secure one blackberry to 1/2 strawberry. Lay the ladybug’s “body” on top of the cupcake cup. Repeat for all 20 cups. Use the black decorating frosting to secure two eyes to the blackberry. 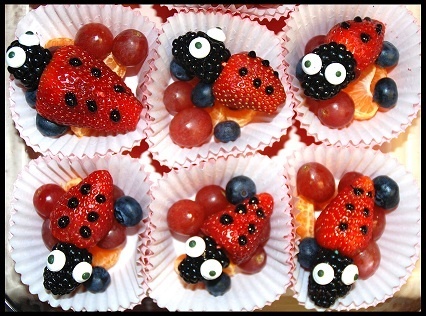 Make dots on each side of the strawberry to create the ladybug effect. And that’s it! Really simple. I hope your little ones enjoy this as much as mine. Leave me a comment and let me know how it goes!